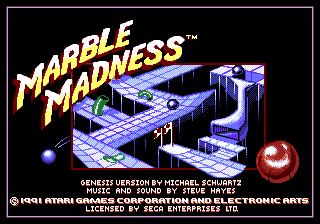 Marble Madness (マーブルマッドネス) is an arcade game developed by Atari Games and released in 1984. Its popularity saw numerous ports to home platforms, including the Sega Mega Drive, Sega Master System and Sega Game Gear. The object of the game is to move a marble down an isometric field from one point to another, making sure not to fall of ledges or be damaged in other ways. The original arcade release relied heavily on a trackball controller, but the console ports rely on directional pad, meaning the control is less accurate. On the Mega Drive, the D-pad moves the ball in the on-screen direction of the button press. For example, will move the marble vertically up on the screen, with the respective effect in the arena. The rights to the game were passed across a multitude of developers and publishers. In 1991 Electronic Arts had publishing rights, and produced a copy of the game for the Mega Drive in North America and Europe. While this version is complete, music porting and text drawing is somewhat sloppy, some of the graphics were recreated, colors were changed (most notably, the marble is now red), and the marble's motion restrictions were somewhat relaxed (allowing for jumps and drops not possible in other versions of the game). Atari Games' home console division Tengen produced their own Mega Drive copy for the Japanese market in 1993, which is different to the Electronic Arts version. This is similar to the situation regarding the Mega Drive port of Klax, in which Namco produced their own copy for Japan. This Japanese version, which appears to have been produced internally by Tengen of Japan, is much more faithful to the original game (but whether or not it is a direct port is unknown), and features trackball support through the Sega Mouse. Virgin Games published a Master System version the following year. Tengen would also publish the Game Gear version. Both the Master System and Game Gear ports were created by Steve Lamb. As with Gauntlet IV, there are two screens of credits. The first screen, the original arcade version's credits, shows after three demo loops. The second screen, the porting credits, comes 12 loops later; just sit back. ©1992 Tengen All Rights Reserved. Main article: Marble Madness/Magazine articles. Main article: Marble Madness/Promotional material. NEC Retro has more information related to Marble Madness.